What is a CNA? The acronym CNA stands for Certified Nurse Aide or Certified Nursing Assistant. It is a person who works under the supervision of an RN or LPN while providing legally designated health care services to patients and long-term facility residents. The American Red Cross plays a central role in the process for becoming a Certified Nurse Aide (CNA) in Pennsylvania. The agency is responsible for processing CNA applications, and scheduling and administering the NNAAP Examination for CNA certification in Pennsylvania. The Pennsylvania Department of Health (Division of Nursing Care Facilities) contracted management of the Pennsylvania Department of Health Nurse Aide Registry to Pearson VUE. Following are the five basic steps from choosing a path to certification to finding CNA employment. To work as a Certified Nurse Aide, your name must appear in the Pennsylvania Nurse Aide Registry. Most people accomplish this by passing the CNA test which is the National Nurse Aide Assessment Program (NNAAP) examination. However, you can get your name listed as an active CNA through eligibility by examination or by reciprocity. There are four ways people become eligible to take the NNAAP Examination to become a CNA in Pennsylvania. Complete one of the Pennsylvania Department of Education nurse aide training programs within the previous 24 months before registering for the exam. Have graduated a Pennsylvania state-approved nursing school within the last 24 months but have not received a nursing license. Are currently enrolled in CNA training in Pennsylvania in a state-approved or out-of-state nursing school AND have successfully completed a clinical rotation in a licensed long-term care facility or nursing home AND have completed courses in certain subjects (listed on PDE-294) with a grade posted on the official nursing school transcript. If your nurse aide registration in Pennsylvania or another state has lapsed because you were not employed to provide nursing-related services for at least eight hours in the previous 24 consecutive months, you are allowed one chance to take and pass the NNAAP Examination. If you do not pass both sections the first time, then you must complete a nurse aide training program in Pennsylvania. After completing CNA training, you can apply for the examination via the E-0 eligibility route. If you are listed as a nurse aide on an out-of-state registry and are in good standing and active, you can make a request to be added to the Pennsylvania Nurse Aide Registry. The Reciprocity Application is obtained through Pearson VUE by sending a request to PO Box 13785, Philadelphia, PA 19101-3785. An approved program is called a Nurse Aide Training and Competency Evaluation Program (NATCEP), meaning it offers the training and evaluation required by the federal government in order to work in a facility that accepts Medicare and Medicaid patients and also required by the state to provide CNA services in any healthcare facility. As of 2017, you can take Certified Nurse Aide programs in nursing homes or at educational facilities. Please use the following tables to find the best local CNA classes in Pennsylvania. The program data is updated in March 2017. Chester Elverson People Technical School, Inc.
Philadelphia Philadelphia Prism Health Aide Training, Inc.
Delaware Upper Darby Successful Aging, Inc.
Lawrence New Castle Golden Hill Nursing Home, Inc.
Tioga Wellsboro Green Home, Inc.
Crawford Conneautville Rolling Fields, Inc.
Allegheny Gibsonia St. Barnabas, Inc.
Luzerne Elmhurst Township St. Mary’s Villa Nursing Home, Inc.
During the 12 months prior to starting a nurse aide training program, obtain a Criminal History Record Information (CHRI) report from the Pennsylvania State Police. The report can be obtained here. The CHRI must not show any prohibitive offenses which are listed in the Resident Abuse Prevention Training Act 14. You can work for 30 days while waiting for the Pennsylvania background clearance, but you cannot begin a NATCEP training program in Pennsylvania until the background check is finalized. If you have not been a Pennsylvania resident for at least two years, it is also necessary to obtain an FBI report, in addition to the CHRI. You can request the report by emailing ra-natcep@pa.gov. You can work for 90 days while waiting for the FBI background check to be completed but cannot begin a CNA training class. A physical examination is required before starting the NATCEP. It must show you are free from communicable disease and had a negative 2-step Mantoux (tuberculin skin test). If the Mantoux is positive, you will have to produce a negative chest x-ray that is no more than five years old. There is a fee for both the CHRI and the FBI report. It is important to understand a CNA student must be physically capable of meeting the occupational responsibilities. They include having full use of both hands, the ability to lift at least 40 pounds and the ability to bend, pull and push. Also, you need at least basic reading, math and writing skills in English. There are many Pennsylvania Department of Education approved nurse aide training programs. Almost each county has one ore more CNA programs, so it is up to you to decide where you want to get your nursing assistant education. 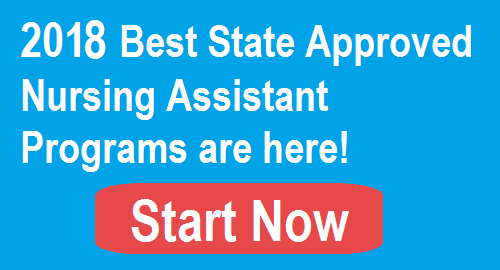 A list of state-approved CNA programs in Pennsylvania as of 2017 is found on this website and on the Pennsylvania Department of Education website. CNA training in Pennsylvania is offered in a variety of venues. They include career centers, community colleges, nursing and long-term care centers, technical schools, Penn State and hospitals. The CNA training in the state will be at least 80 or more hours including 37.5 hours supervised clinical training. However, programs vary by facility in terms of requirements and length. For example, the American Red Cross (ARC) course is 110.8 hours, while the Community College of Allegheny County (CCAC) Nurse Aide Training Program requires 98 hours of lecture and 70 hours of clinical training for a total of 168 hours. The ARC program is four weeks long, whereas the CCAC program is 10 weeks long. A 110.8 hour course through the American Red Cross is $1,300.00. You will need to purchase the uniform and textbook. However, there are grants available for people who make less than $8 per hour or who are working 20 hours or less each week. At the Community College of Allegheny County, the student must pay $949 course fees plus purchase a uniform with shoes and a textbook. In all cases, the competency exam fee is in addition to the tuition for the CNA courses. Pennsylvania will let a nurse aide work in a nursing home for up to 120 days while completing training and testing, or while waiting for reciprocity approval from another state. If you are employed or are offered employment at a long-term nursing facility at the time you start a NATCEP program, Federal Regulations require the employer to pay all the training and testing costs. If you are not employed with a long-term care nursing facility when you begin a NATCEP, and pay the training and testing costs yourself, you can request reimbursement from an employer if employed within 12 months of completing the NATCEP. The school where you complete training will give you a reimbursement receipt that you can present to the employer. The Pennsylvania Department of Education – Bureau of Career and Technical Education has established the standard curriculum for the state-approved CNA training classes. The CNA curriculum covers the information and skills you must master to pass the competency exam and to competently perform the typical work duties of a CNA. Students get training in the classroom and lab, and supervised clinical training. There are 22 skills on the NNAAP Skills List that you will learn by completing the curriculum, and five are tested during the Skills Evaluation portion of the exam. The typical American Red Cross approved CNA classes in Pennsylvania consist of classroom hours, lab hours and clinical hours for a total of 110.8 program hours. Upon successfully completing the program, you will get a Certificate of Completion that indicates how many hours of training were complete and provides the Pennsylvania Department of Education Training Code. The National Nurse Aide Assessment Program (NNAAP) is an examination designed to verify a person completing a CNA program has achieved minimal or entry-level competency in the required skills. This examination was developed by the National Council of State Boards of Nursing, so it is used in most states as proof the process meets state and federal evaluation requirements. The only time you do not have to complete the training program to take the CNA exam is when you are following the E-3, E-4 or reciprocity eligibility routes for examination as described in Step 1. On the registration form you can indicate if you want to take an Oral Exam instead of a Written Exam. If you want to become an active member of the Pennsylvania Nurse Aide Registry via reciprocity, contact Pearson VUE at 800-852-0618 or download the Application for Enrollment by Reciprocity at www.pearsonvue.com. The fees are subject to change. Fees can be paid in the form of a money order, certified check or company check only. If you are employed by an eligible facility, the facility will pay the fees by law either when you submit the registration form or later when you claim a reimbursement, as explained in Step 2 in the section “Cost Reimbursement.” All fees are paid to the American Red Cross and are non-refundable. Once approved for nurse aide testing in Pennsylvania, the American Red Cross will mail a Confirmation Letter to you. If you are unable to take the exam on a confirmed date, you can request to re-schedule up to three business days before the date of the exam. If you meet the three-day requirement, the fees are transferred to the new date. Fees are forfeited if you fail to show up on a confirmed exam date. The only exception is in the case of unexpected personal situations like a death in the family or a disabling traffic accident. The American Red Cross will review each request and the documentation to determine if there is a valid excuse for missing an exam. If approved, there is no re-scheduling fee. Call the American Red Cross at 800-795-2350 to re-schedule an exam. The 2017 list of permanent test sites and dates is found here. The list is subject to change. Pearson VUE manages the Regional Test Sites and can provide test accommodations based on a case-by-case review. Arrive at least 30 minutes before the start of the exam. Do not bring any electronic devices or personal belongings into the exam room. There are two parts to the NNAAP examination which are the Written (or Oral) Examination and the Skills Evaluation. You must pass both parts to become eligible to have your name placed on the Pennsylvania Nurse Aide Registry. The Written Exam has 70 multiple-choice questions that are presented in English. All 70 questions test knowledge of CNA skills. If you have difficulty reading English, the test can be administered as an Oral Examination. There is a self-assessment reading test available at www.asisvcs.com. The Oral Examination is structured slightly differently in that 60 multiple-choice questions test knowledge of CNA skills, and 10 questions test reading comprehension and recognition of common words used in the CNA profession. You get two hours to finish the Written (or Oral) Examination. The Nurse Aide Practice Written Examination with answer key is available here. Take the CNA practice test while timing yourself, check your answers against the answer key, and review any answers that are incorrect. There are other practice examinations easily found online if you want test yourself with additional questions, like the one here. The Skills Evaluation portion of the NNAAP Examination requires you to perform five nurse aide skills in front of a Nurse Evaluator. One of the skills tested will include measurement. The skills are randomly selected from over 22 skills on the NNAAP Skills List, and these are skills you learn by completing the curriculum during the training program as described in Step 2. The test is performed in a setting that models a real-life situation, and a fellow candidate will act as the patient or resident. You must pass all five skills tests and have 30 minutes to do so. The Nurse Aide Evaluator will fax the two scores for the Written (or Oral) Examination and the Skills Evaluation to Pearson VUE. An official Score Report is sent back to the test center. You get three tries to pass both parts of the competency examination. You only re-take the section you fail. To retake one or both sections, you need to send a new exam application, a copy of the failing Score Report and fees to the American Red Cross. If you do not pass both sections within three tries, then you will have to complete the training program again. Once training is completed, you get another three attempts to pass the exam and must re-take both exam parts. Remember, the only exception is the E-3 and E-4 candidates who can only take the examination once (Check Step1). There is a report online here that reports statistics on exam pass rates in Pennsylvania and gives a detailed analysis of NNAAP skills with the lowest pass rates. Review the list to ascertain which steps are missed most often and be sure to give extra attention to these areas while training and studying for the competency evaluation. Once you pass both sections of the examination, your name is added to the Pennsylvania Nurse Aide Registry. After you are listed on the Pennsylvania Nurse Aide Registry, a Registry Card or Notice of Enrollment is mailed to you. When renewal time gets close, you will get a notification of continued registry enrollment in the Pennsylvania Nurse Aide Registry for another 24 months from Pearson VUE. You must meet all renewal requirements before registration is continued. The recertification notice is sent approximately 90 days before the current registry listing expires. To renew, you have to work at least 8 hours as a nurse aide for pay in an approved facility during the 24-month period covered by the registry in order to be eligible to renew CNA certification in Pennsylvania. An approved facility includes personal care homes, nursing agencies, hospitals, nursing homes and intermediate care facilities. Working in a doctor’s office or as a self-employed nurse aide is not accepted work for registry renewal. Pearson VUE offers an online registration renewal process to certified Pennsylvania nurse aides. The Pearson VUE Uniform Licensing Solution for E-Government (PULSE) allows you to renew your nurse aide registration after receiving the continued enrollment notice. There are no Continuing Education Unit requirements for CNA renewal in Pennsylvania. However, nursing homes are required to offer nurse aides at least 12 hours of in-service education on an annual basis. The type of education is based on what the performance evaluation indicates is needed in the way of training. In addition to the education offered to correct weaknesses, the nursing home will also offer in-service training on a variety of critical topics like Infection Prevention and Control, Resident Confidential Information, Abuse Prevention and much more. Once you are renewed in the registry, you will receive a new Registry Card. The card plus the certificate you received upon completing training program are solid proof of active registry status. Keeping your employment history updated is important for avoiding a lapsed registration. You can use PULSE system to make name and address changes at any time. A name change requires written documentation. Employers can use the PULSE Portal for CNA verification, or to add or terminate an employee. The federal occupational code for Nursing Assistants is 31-1014 should you choose to do additional career research. As the population ages and the healthcare industry works to keep hospital stays as short as possible, the employment prospects for CNAs will grow. It is an excellent healthcare entry career. During the performance of each CNA skill, you will rely on your knowledge and experience to help patients or residents achieve the highest quality of life possible given their circumstances. It is an important role because the Certified Nurse Aide is the person who spends the most time with each client on a regular basis. Per the U.S. Bureau of Labor Statistics, Pennsylvania was one of the highest employment states for CNAs. It was the fifth highest state as of May 2016 in terms of number CNAs employed. The annual mean (average) CNA salary in Pennsylvania was $29,190 or $14.03 per hour as of May 2016. For comparison purposes, Alaska has the highest annual average wage at $37,520; New York is at $34,300; and Connecticut is at $32,140. Lower paying states include Louisiana at $21,610; Mississippi at $21,640; and Alabama at $22,690.